In 1677 a case came to the Exchequer between the lord of the manor (the Duke of Buckingham) and his trustees and the draper William Gyles. Evidence was taken at Winslow on 12 Oct 1677. There is a full transcription (over 11,000 words, PDF file) here: Buckingham v Gyles (we've retained the original spellings and lack of punctuation). There is a list of interrogatories on behalf of the Duke, i.e. leading questions, followed by the witnesses' answers, then Gyles' interrogatories and the answers. The main issues have been summarised below, with a list of all the deponents who gave evidence. A market was held every Thursday in the Market Place, and there was an annual fair on 10 August. Each resident of the manor who paid the bailiff 4d a year could have a stall. Outsiders could have a stall if they paid the bailiff 1d each market day, or 2d on fair day. The north-west part of the Market Place was known as Butchers' Row. Another part was called the Sheep Market, where people set up sheep pens outside their houses. Sometimes the bailiff subcontracted the market to someone else who paid him £30 a year and took all the profits. That implies that the rents and other revenues from the market came to about 8-10s per market, i.e. a lot of stalls. Probably most of the revenue didn't come directly from rents for stalls, but from the "toll of corn and cattle" mentioned by Andrew Stutsbury. The witnesses were asked whether there was a custom book setting out the rights of lord and tenants, but evidently there wasn't. 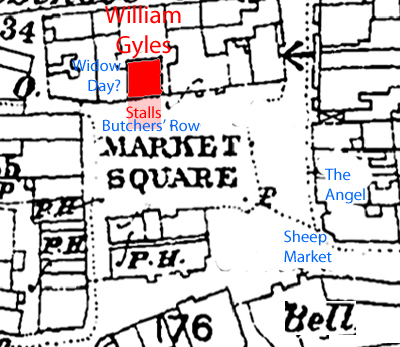 The dispute was about William Gyles' right to set up two rows of stalls in front of his house (extending 28 feet into the Market Place), let them to other people and keep all the profits apart from paying 4d a year to the bailiff. There was also a question of whether Gyles had suborned a witness. 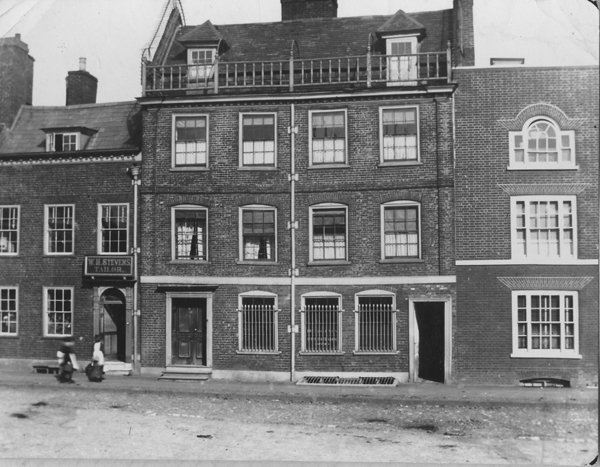 William Gyles lived on the north side of the Market Place, where the Bank now stands (the evidence from the trial enables the house's history to be traced back to the early 17th century). There is a photo of the house (right) from c.1890, just before it was demolished, but in Gyles' time it would have been a timber-framed building, probably with a jettied upper storey, and with a gap between it and the adjacent houses. It seems to have been subdivided. There was waste ground next to it which people rented in order to set up extra stalls. The evidence is contradictory about whether Gyles and previous occupants of his "ancient messuage" had been setting up stalls and taking rents for them for 60 years or more, or whether the bailiffs had always insisted on controlling all stalls in the market and had not necessarily allowed the occupants of adjacent houses to set up their own stall in front of their house. John Rawbone, a butcher from Stony Stratford, said that for the last 16 years he had been paying 4d or 6d each time to use one of Gyles' stalls, but George Shaw said that Gyles' father and grandfather never set up more than one stall in front of the house, or prevented him (Shaw) from setting up other stalls there. According to Thomas Eddyn, between 1664 and 1668 Gyles used to set up between 2 and 11 stalls for butchers, and paid the bailiff £8. The map on the left (based on the 1880 Ordnance Survey map, the earliest one with this much detail) shows the places mentioned. The case had already been to court once. In c.1656, Gyles took the then lords of the manor (Robert Bowden and others; the Duke of Buckingham's property had been sequestrated) to the Bucks Assizes in order to recover some cloth which had been seized in lieu of payments which they claimed were due from him. Gyles won the case, with the support of the former bailiff Peter Fyge sr (then aged nearly 90). William Pease ("a very aged man") said the occupants of the house had set stalls in front of it for 60 years. George Shaw gave evidence against Gyles and Peter Fige sr and jr the bailiffs (his employers) which evidently wasn't believed, and it is unlikely that it was regarded as more credible in 1677. There is no direct information about the outcome of the 1677 case, but in 1682 William Gyles handed over to his son "a messuage with the Stalls", which strongly suggests that he had won. It's hard to know why the Duke of Buckingham's agents brought the case about a tiny (for someone with an annual income of £5,000) amount of money. There's no sign that it was personal, even though Gyles was Winslow's leading Baptist, as the Duke's trustees were selling him land in 1680; in fact one witness implied that the vicar Samuel Dix had been helping Gyles. Perhaps it was a test case that had implications for the rights of everyone living around the Market Place to set up extra stalls. The income for the lord of the manor would be boosted if he could make all stallholders pay him directly. There was evidently a danger of people encroaching on the Market Place, as the inhabitants had been forbidden from enlarging their premises and had to take down their stalls at the end of every market. All gave their residence as Winslow unless stated. Some of them were born in the reign of Queen Elizabeth. Most of their evidence was about the stalls in the market. Some more information about them has been added in brackets. George Shaw yeoman aged 92. He had known Winslow 66 years, was servant to Mr Fige the bailiff for 30 years, had been setting up stalls since 1623, and rented the market for 6 years. He claimed that when he was going to give evidence to the steward 6 years earlier, Gyles said to him: "George, you are now going up to the Steward. George, if you will not speak what you do know I will be a friend to you as long as you live." This was the source of the allegation that Gyles suborned a witness, but Gyles claimed that Shaw's evidence was discredited at the assizes, and that he was an “Idle loose and debauched liver” given to "profane swearing". William Burrell heard Peter Fige jr say “that he [Shaw] was a forsworne man & that he tooke a false oath”. He was buried in 1679. Catherine Shaw spinster aged 46 (49 according to the parish register). She confirmed her father's story and also said that about 6 years ago “the defendant Giles' wife did send for this deponent's father George Shaw to the house of one Mr Dix Minister of Winslow”, and told him not to declare the truth about the stallage. Thomas Knight shoemaker aged 45. He was apprenticed to his uncle Thomas Norcott shoemaker, who (he said) rented the setting of about 6 stalls in front of Gyles' house for 6 years for 6s p.a. or a pig. Norcott and Widow Day (buried in 1647) lived next door to Gyles (probably in the second Church House, on the left in the photo above) and were said to have erected stalls in front of his house with the bailiff's permission, but Gyles claimed that Widow Day used to compensate his grandfather. John Rawborne of Stony Stratford butcher aged 63. For 16 years he had rented a stall from Gyles for 4d or 6d. William Burrell butcher aged 52. He “did dwell in a house next adjoining to the house wherein [Gyles] now dwelleth & used to set out four stalls in right as belonging to the said house”, paying the bailiff 4d p.a. Joan Lettman of Shenley widow aged 76, had known Winslow for 60 years (she was the daughter of Ralph Mitchell, married Richard Letman in 1632, and was living in Sheep Street in 1669). Mary Gearle wife of William Gearle of Buckingham aged 55, had known Winslow for 36 years, was previously married (in 1641) to Thomas Pitkin (she was daughter of William Lowndes, died 1683). She said her father used to sub-let the sheep pens at The Angel for £3 p.a. Robert Lowndes of Bow, Middlesex, yeoman aged 58, gave detailed evidence on Gyles' behalf (son of William Lowndes and father of the builder of Winslow Hall - but what was he doing in Bow? ).